What a long road this comeback is going to be. Before I broke my elbow last year, most days of the week involved anywhere from 13-25 miles just to commute. I could go out on a 40-mile weekend sweetheart ride without trepidation. Biking didn’t represent any kind of chore. The few times I’ve ridden during my recovery I’ve been so happy to be back on the bike while I was on it, but a bit sore and sorry later that day when the shock-absorbing insults made themselves known. 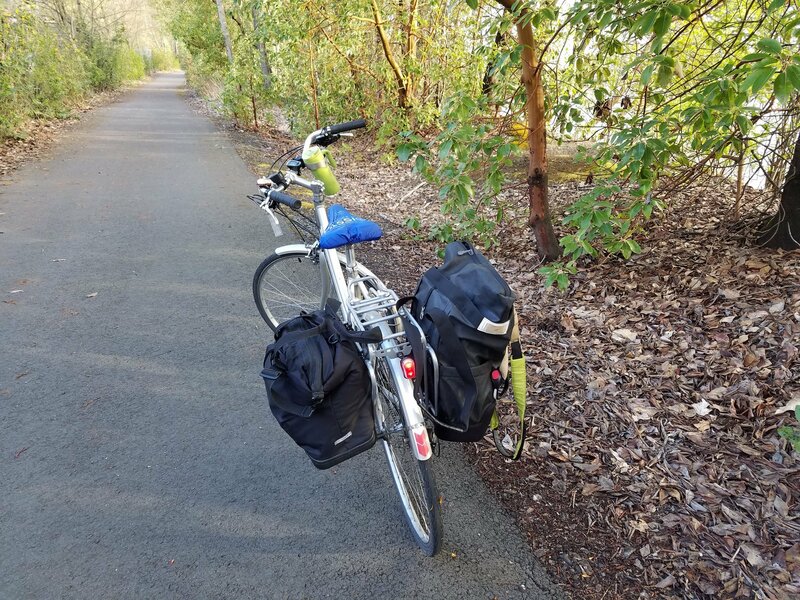 With regular physical therapy and massage and reasonably good follow-through on my daily exercises I felt I was ready to pledge for #30DaysOfBiking. I’ve attempted it several years, sometimes successfully, sometimes not. Whatever I could do would also help me get ready for the May Bike Everywhere Challenge. That commitment to daily rides, no matter how short, was a way to make biking automatic again. Well, not exactly automatic. My work now requires some days in Olympia (an hour’s drive south from my house), some days in Seattle (an 8+-mile bike ride north). I’m thus back to that more complicated stage I went through in starting to commute by bike. Some days I need to make sure there’s gas in the tank, some days I need to make sure the tires are pumped up. Every day I need to make sure I’ve packed what I need. And if I’m going to bike on Olympia days I really have to plan. Sunday April 2: We spent much of the day on the road (in a car) picking up my stepdaughter so she could spend spring break with us. End of the day, back home in the dark, I hopped on Tessa (short for Tesseract), my folding bike, and tooled up the hill on our short block and back down again. Day 2 #30DaysOfBiking: Just turned the pedals on Tessa the folding bike up our short block and back down in the night rain. It counts. Monday April 3: The real deal — commuted by bike the 8 miles to my office in Pioneer Square, put the bike on the bus to come home end of the day, a final few turns of the wheels the .60 miles home from the bus stop. Tuesday April 4: Did the trip to work again. My workplace has indoor bike parking in the lobby and basement and I can bring my bike into my office. Wednesday April 5: An Olympia day so I took Tessa with me (folding bikes rock). The rain was really coming down when I got there so it was a damp ride to a meeting about a half-mile away — slightly damper since I accidentally didn’t take the most direct route. Damp again on the way back but it still felt better to ride than not to ride. Thursday April 6: Road bike today. A quick sprint to the bus, once again in really pouring rain. The “oops” was that I got to the bus stop only to discover that my head bore my wool hat, no helmet. When I headed to a midday meeting in downtown the weather had improved to merely overcast. By the afternoon glorious sunshine beat down on bewildered Seattleites, leading to actual outdoor cafe seating usage. It felt so fantastic to experience the urban mobility of a bike in downtown. No impossible search for parking, a feeling of freedom rather than constraint and frustration, constant progress toward my goal rather than long waits thanks to the geometry of my vehicle. Friday April 7: Another drive to Olympia. At the end of the day when I put the car back into storage I grabbed my bike from my office, caught the bus, and rode home from the stop. Back to the rain. As I pedaled along in a black overcoat and my Wander Wrap on my upright bike, I couldn’t help but hear the Wizard of Oz score when Miss Gulch rides her bike. This isn’t any kind of high-mileage week but that’s not the point of 30 Days of Biking. I can’t ride very far yet post-injury. Beauty of @30daysofbiking: it isn’t about distance, it’s about persistence. Will you pledge?